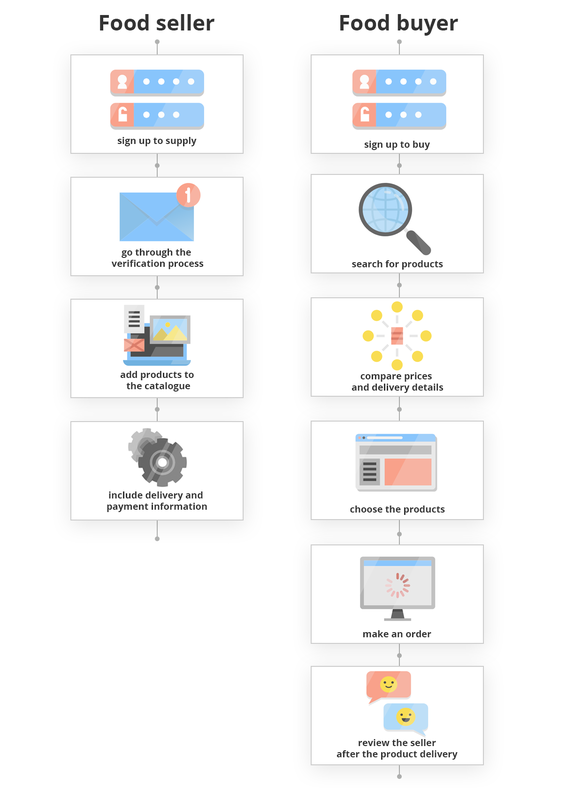 First of all, let`s define what is B2B food marketplace and how it works. The main goal of B2B online marketplace is to make the process of selling and buying tech-savvy and transparent by eliminating all the paperwork. This is how this process is going on. 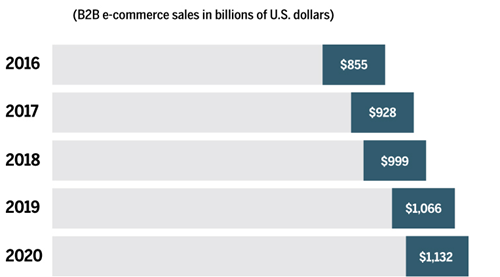 According to Forrester, B2B e-commerce will top $1.1 Trillion and account for 12.1 % of all B2B sales in the US by 2020. The benefits of online B2B platforms are outstanding, especially if we are talking about the food industry. Such platforms allow entrepreneurs to speed up the process of delivery, save time and resources, synchronize the workflow, and track the analytics. However, B2B businesses face a lot of issues when pushing the product onto the market. Let's dive deeper into them. First question that appears in your potential user`s mind is why should I buy or sell on this platform? Is there any guarantee that I will receive qualitative products? You should spare a lot of time and think about how you can prove the authority of your platform. Think to the nails about the process of registration. In order to sign up or register your users have to be affiliated with a licensed restaurant, cafe, catering, or hotel. Providing a certificate should be also essential. Leaving reviews about the seller after the delivery is a must. Stay tuned for these reviews and leave only those who have a high rating on your platform. The main risk your users may face is that they will not be satisfied with the product bought on your B2B platform. That is why it is important to explain the shipping and returns policy in a very detail and provide your users with the money-back guarantee. If people know that they will not lose anything by using your service, they are more likely to make a purchase. Your customers are the driving force of your product. That`s why you need to have a clear vision of who your audience is. This is how you can do it. Pushing your product on the market without knowing your competitors is like shooting in the dark. Thoroughly research the strategy and business models of your competitors, it will help you to find the direction to move to. You can also do this with the help of the following useful tools: SpyFu, SEMrush, SimilarWeb, and Alexa. They allow you to make competitor research and get insights of your target market. One of the ways to outstand your competitors is to specialize in a certain industry. In such a way, you will form a dedicated audience around your product. For example, you may specialize on selling only organic products, spices, or fruits and vegetables. In case of B2B food industry, your buyer persona are both manufacturers and bulk buyers. If you only start to head into the market, reach out to your network (co-workers, partners, social media network) to get a large number of people who may become your target customers. Your aim at this stage is to find out their pain points and challenges. After this, think about how your platform can solve them. Think about how you will be different from your competitors. One of the ways to do it is to expand the functionality of your platform. You can add more useful features or broaden the choice of products. Value proposition. These two words will bring your business to the new level. Give your users something unique and different. Here are some ideas for you! Integrate analytics for tracking the product performance in different cities and areas, seeing the products in-demand, and analyzing sales performance. Reward your users for choosing your B2B platform. For example, you can offer them reward points for the money they spend ordering online, referring a friend, restaurant, or caterer. Then these points can be replaced with discounts on your marketplace. For example, if your platform sells organic ingredients to cafes or restaurants, you may partner with a company that sells culinary herbs, and offer your customers different packages at a discount price. Don't turn your marketplace into the godforsaken place. Remember about your users and always treat them with different novelties. The words of founder and CEO of Floor 64 suit here better than ever before. To decide on the business model of your product, think about the following factors: key activities of your company, key resources needed for your product promotion, your value proposition, relationship with your clients, market segmentation, revenue channels, and marketing channels. Let's review it in a very detail. It doesn't matter what business you are in, your company will not survive without the profitable clients. In order to satisfy the clients` needs, you have to divide them into groups. Segment your clients according to the distribution channels, interests, offers that are interesting for them, and aspects of the proposal. Remember, there is no ‘one size fits all’. Before building a business model, it is important to remember that different clients need different approaches. Express your idea to your potential customers, visit the niche conferences, events, summits, and get connected with the potential partners. Create the brand awareness for your product and step out of the shadow. Create your product landing page with the contact form to communicate with your potential customer, get listed on the niche sources, launch your corporate blog and give people useful information for free. Ask yourself what your clients will pay for. Business models usually include two types of revenue channels: profit from isolated deals and regular profit from periodical payments. B2B food marketplace is a multi-sided platform. Your aim is to attract and maintain two sides simultaneously. You will not attract manufacturers and distributors if there are not enough bulk buyers, and vice versa. One of the ways to do it is to provide free value for one of the consumer segments and attract another segment through it. Let us provide an interesting case about the Microsoft company. It was distributing its Software Development Kit for free in order to encourage the development of applications for their operating system. The growth of number of applications has lead to the increase in the number of Windows users. As a result, the Microsoft revenue was significantly increased. Think about what you can do for one group of users in order to attract another group. To wrap it up, most B2B startups fail because they start developing a product without having a clear understanding of their target audience, business model, value for users, and ways to create the brand awareness. We believe that this is not about you!